When you aren’t a beekeeper or don’t know a beekeeper, you get jars of honey from the store or buy it from a local beekeeper and that’s about it. Have you ever wondered how that honey gets to the jar and then into your home? It can be a long process for beekeepers to extract honey, but in the end, the final golden, delicious product is worth it. The first thing the beekeeper does is gather the frames full of honey comb and honey from the beehive. They need a smoker in order to complete this job. The beekeeper will light the smoker using pine needles, dry branches or other easily flammable kindling. The smoker is an essential tool because it calms the honeybees and makes them gorge on honey, which further pacifies them so beekeepers can work the hive. 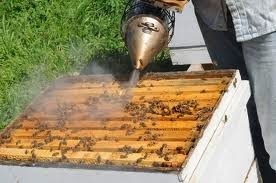 The beekeeper will open the hive with a hive tool and blow some smoke into the hive while lifting the lid slowly. Next, the beekeeper pulls frames out of the super and inspects the honey combs. There could be multiple supers on one hive, each filled with frames. 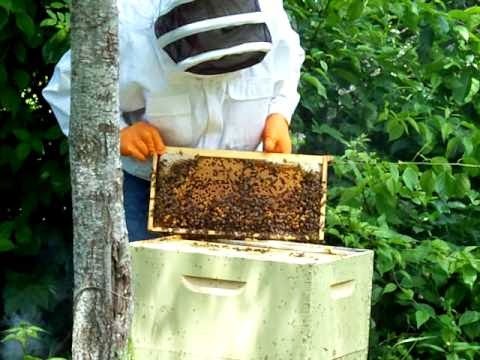 Depending on how busy the bees were, how warm it was, and if the hive didn’t swarm, there could be anywhere from 20 to 100 pounds of honey in a super! 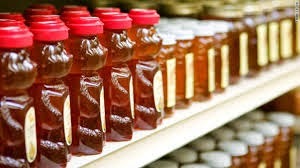 Only completely sealed frames of honey are harvested. An easy way to transport the frames full of honey is to have an extra empty super to put them in until the beekeeper can extract the honey. Each frame can hold an average of 6.5 pounds of honey. Once the beekeeper is ready to extract the honey, they have to uncap the wax cells from both sides of the frame. They place the frame above a tub to catch the wax and honey that comes off with the wax. 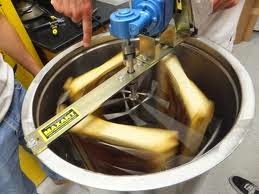 The beekeeper will run a heated knife called an uncapping knife down each side of the frame to unseal the cells. 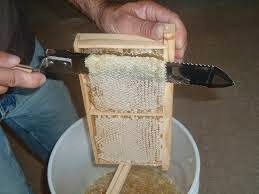 They don’t linger too long on the frame with the uncapping knife, because it can burn the honey! Then, the beekeeper will use an uncapping fork to gently shave off the caps of the cells to catch any cells that weren't uncapped with the heated knife. After uncapping each frame, they place the frames into an extractor. This is a large barrel like machine that has a motor or hand crank used to spin the frames. When they start the extractor, the centrifugal force created by the extractor spins the honey out of the honeycomb onto the walls of the extractor. Thanks to gravity, the honey drips to the bottom of the extractor. There is a spout (which can be kept closed or open) where honey comes out at the bottom of the extractor. The beekeeper can either place a food grade bucket underneath the spout to catch the honey and bottle it later or bottle it as it comes out of the extractor. 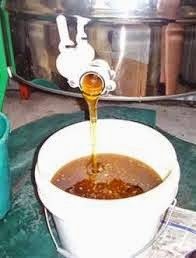 Typically they’ll place something like a colander over the jar or bucket to strain any extra wax that may have ended up in the honey. After they pour honey from the extractor into the jars, it’s locally sold or sent to farmers markets or grocery stores where it finally makes it to your home!